Want to understand religion in Africa? Then the map above is a good place to start. Basically, Islam dominates the North and East of the continent, while Christianity dominates the South and West, whith other native and folk religions being scattered throughout. The data comes from the Pew Research Center and it shows that Christians make up 50.9% of Africa’s population, followed by Muslims at 43.3% and others with 5.8%. It’s important to note that the reality on the ground is much more complicated than this map would have you think. The map just shows what religion is predominant in a given area and doesn’t show the share of the population that actually follows it. Like the rest of the world, migration and demography mean that the situation is constantly evolving. Just have a look at this Incredibly Detailed Map Of The World’s Religions. For example, did you know that there are somewhere between 4 to 8 million Egyptian Christians who are estimated to be around 10% of Egypt’s population. Or that Ethiopia, one of the first countries in the world to adopt Christianity as state religion, is only 63% Christian and 34% Muslim. However, it’s Nigeria that is perhaps the most interesting. While not only the largest country in Africa in terms of population (over 180 million) it’s also almost evenly divided between Muslims (50%) and Christians (48%). And finally, in case you’re wondering, that Christian enclave in Madagascar is centred on Antananarivo, the current capital and the base of French colonial rule in the past. hey, is this image copyrighted. I am currently writing a book of African countries and would like to feature the in my work. If i can not, please just say. I remember thirty years ago, when I used to live in Togo, religion was the standard discussion topic with taxi drivers, and the most common affiliation was “I’m christian, muslim and animist because, you know, better take all chances”. So this map is wrog at least for west africa, which should probably not be a pusszle but a superposition of all three colors. This is very wrong. Ethiopia is a Christian country even though there are Muslims. Stop posting things you aren’t sure of. Specially about what is not yours. 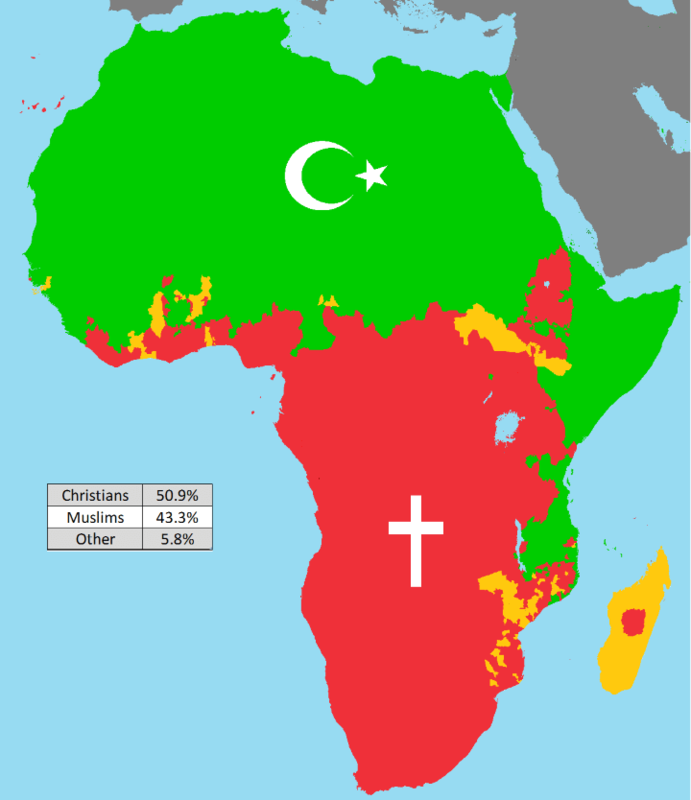 You even said it that 63% are Christians in Ethiopia, then why you color it green? Seriously, you need to check out the whole map again. . .probably you have mistaken others too.